00:15:01 Zagor Hes: are you awake? 00:19:24 *** Saving seen data "./dancer.seen"
00:39:07 Silly_Fly what is lcd_getstringsize? 00:39:36 Jet8810 does anybody know where to find info on swapping out archos hard drive? 00:40:22 Silly_Fly lcd_getstringsize(string). no other pparameters? 00:42:56 Silly_Fly so it puts the height and width in h and w, right? but then what it returns? 00:44:53 Silly_Fly any info on when sourceforge.net is back? 00:45:20 Bagder has it been gone? 00:46:00 Silly_Fly The SourceForge.net Website is currently down for maintenance. 00:53:03 mecraw How do I store something in rtc? What address should I use? 00:53:37 mecraw Do I just pick any bit that isn't being used? 00:57:18 Bagder "The PBDR stays at FBBF no matter what button I press! (I tried all of them once I found that ON had no effect)"
00:58:44 Zagor ok. hi lohap. 00:59:28 Zagor lohap: plug it in, run "mount -t vfat /dev/sda1 /mnt/archos"
01:00:23 Zagor lohap: which linux distro are you using? Red Hat? 01:00:51 Bagder you run usb2 or usb1.1? 01:02:02 Zagor d you have a directory called /proc/bus/usb ? 01:03:36 * adi|home hmmms to Bagder? 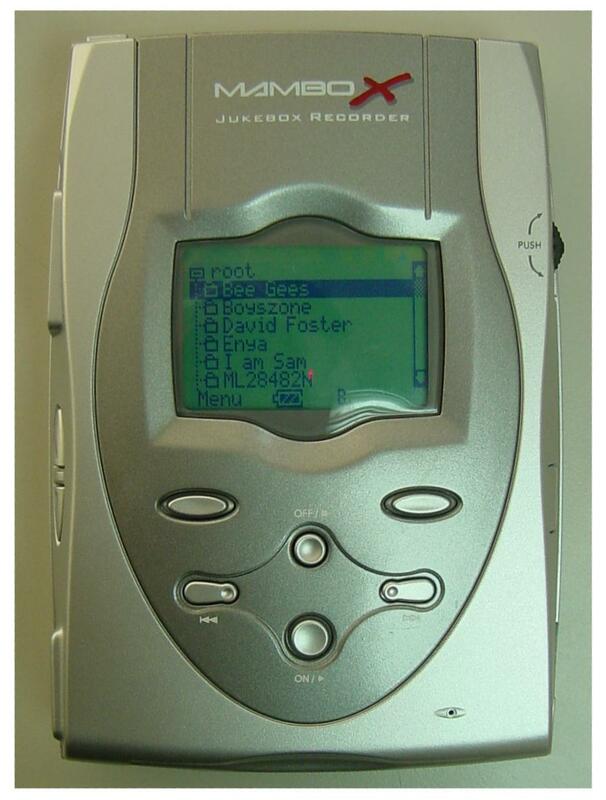 01:08:25 adi|home Zagor have you discussed the use of a 'rockbox' directory under root yet? 01:09:37 Zagor is it? why? 01:10:04 Zagor Bagder: even from the prompt? 01:10:58 Zagor Bagder: what did you expect? this was windows! 01:11:11 adi|home is there any way we could make the ones on the main page thumbnails? 01:11:18 adi|home the full image takes way to long to dl. 01:12:03 Zagor mecraw: in explorer or from the prompt? 01:12:37 Zagor mecraw: but you can see it and navigate into it with the explorer? 01:12:55 Zagor lohap: you need to download, patch and compile a new kernel. 01:14:05 adi|home hmm win2k i can make .rockbox with no prob from prompt..
01:16:41 Zagor "The 2.4.19 kernel is the first to bundle a 2.4 based version of the ehci-hcd driver." 01:24:14 Bagder shortcut to the command? 01:26:21 adi|home unix came first! 01:26:36 juergen this is juergen, wants to buy a recorder 20 with USB2, would rockbox work? 01:27:34 Bagder juergen: compared to what? 01:29:18 Bagder so you say there's a rec20 that isn't usb2? 01:34:09 juergen looks like it, certainly! Good code, I read through it! 01:40:53 adi|home okay.. thats it... wtf did Zagor go? 01:42:16 adi|home and tell me if you see a question #39? 01:43:38 adi|home but WTF has that question not shown up on the website.. but the other changes have? 01:45:45 adi|home yeah? whats that? 02:19:27 *** Saving seen data "./dancer.seen"
02:31:33 mecraw Can anyone help out a hex-illiterate? 03:04:16 alphawave can someone help walk me through being delveloper? 03:04:58 mecraw maybe, what's the question? 03:06:28 mecraw you look at CVS through the web? 03:07:27 mecraw are you trying to download the source? 03:08:18 mecraw Do you want the absolute latest or just a tarball that's updated daily? 03:09:56 mecraw MeRWiN: are you hex-literate? 03:10:18 MeRWiN mecraw: sorta... whatcha need? 03:11:07 MeRWiN I can't help you much with RTC. 03:11:54 alphawave ok im at dowloads at cvs.com but whick one is needed? 03:13:04 mecraw are you running linux or windows? 03:20:25 mecraw 802.11b or a? 03:21:59 MeRWiN GPRS is the "new" cell phone data connection standard. 03:22:31 MeRWiN alphawave: better than nothing though. 03:26:04 alphawave so are you in sweden? 03:31:56 alphawave when does bjorn come into irc? 03:35:09 alphawave did you see defcon where they were looking for open 802.11b networks? 03:39:24 alphawave so merwin where you flying 2? 04:19:32 *** Saving seen data "./dancer.seen"
04:26:54 nunya HELP! Using the 0825 daily build on my player (firmware 4.53). No resume. I saw mention that it is under General Settings under the main menu... but not on mine. Am I totally missing something here?? 04:27:44 mecraw did you scroll all the way down? 04:33:35 nunya ver 4.53.. dat's it! 04:42:45 nunya HELP!! any player peoples out there awake?? 05:22:33 nunya did u rename it archos.mod? and just copy into root of drive? 06:19:34 *** Saving seen data "./dancer.seen"
07:04:32 MeRWiN so, do you get that 1 or 2 second delay when changing tracks sometimes now? 07:05:17 hardeep Hmmmm, when selecting next? 07:05:24 MeRWiN do you get that 1 or 2 second delay when changing tracks now? 07:14:55 LinusN anyone here with a recorder 6? 07:15:53 LinusN and you have no problems with ON? 07:16:17 LinusN whar ROM version? 07:18:08 LinusN does the stock firmware use the ON button for something? 07:22:04 LinusN hardeep: you mean turn the unit on when in charge mode? 07:27:38 hardeep Wow, it's been a while since i've used the stock firmware. 07:34:51 LinusN h0bby: what model? 07:37:56 h0bby but without any it loads the original harware? 07:40:10 LinusN h0bby: next question? 07:42:24 MeRWiN when are we plopping 1.3 onto the masses? 07:43:39 LinusN and it will rock! 07:44:05 LinusN Hes: what's the prob? 07:45:19 hardeep Did it turn out the skip problem was something else? 07:45:20 LinusN you want me to test your code to see if the problem is the same? 07:45:32 LinusN hardeep: no i don't think so? 07:59:47 Hes I'm driving to the office now, talk to you from there. 08:00:53 Bagder LinusN: you saw the ON problem on the rec6 ? 08:10:47 LinusN hardeep: and the LED stayed ON? 08:19:35 *** Saving seen data "./dancer.seen"
08:23:19 MeRWiN- any clue what the restore variable is in the wps? 08:25:46 Hes With the old disk and older firmware i had 0 skips while driving! 08:26:11 Hes I drove a couple days straight without any skips. 08:26:24 Hes This _could_ be a problem with the disk. 08:27:13 Hes Hey, as I don't have a remote, could I wire the serial output to the serial input of the phone plug to get the DEBUGF()'s? 08:28:05 MeRWiN- What does "Up to date check failed" mean when dealing with cvs? 08:29:09 Bagder mecraw: sounds fine! 08:29:42 Hes Could i simply make it write the DEBUGF()'s to the serial out in simple ASCII without gdb involved? 08:32:07 Hes It's TTL, right? 08:33:47 Hes Hey, does disabling key lock work for you any more? 08:36:32 Hes ahh, it works for me too..
08:37:51 rwood LinusN: High Speed i2c max scl 1.7 to 3.4 MHz depending on bus cap. 08:38:23 bobTHC good morning !!! 08:39:41 LinusN rwood: you saw lots of IRQ0? 08:41:11 LinusN back to 100? 08:44:37 * Hes gets some coffee and digs into IPv6 DNS reverse zone generation again. 08:46:11 LinusN rwood: what are you talking about? 08:47:36 rwood LinusN: is there a possibility of a device holding SCL or SDA low while the firmeware is trying to drive the pin hi? 08:48:02 LinusN rwood: sure, why not? 08:49:07 rwood LinusN: isn't the pin driving into a ground in that case? 08:53:50 LinusN mecraw: what are you talking about? 08:58:53 Hes Could we isolate what changed in the code and caused this? 08:59:02 rwood LinusN: 2nd topic, I am using a power supply in place of the batteries. 08:59:28 MeRWiN- It's actually happening almost every song? 09:00:39 Hes It's actually happening on almost every song, yes ! 09:01:14 MeRWiN- Hes: what problem are you talking about... same as me? 09:02:09 Hes Same as you. 09:02:16 MeRWiN- Hes: so i'm not going insane? 09:02:25 Hes No you're not. Mine is skipping a lot. 09:02:44 MeRWiN- usually towards the end of the song? 09:09:53 MeRWiN- rwood: why are you running pre 1.2? 09:14:44 MeRWiN- hardeep: player or recorder do you have? 09:15:05 MeRWiN- hardeep: may it be player only? 09:15:41 hardeep Hmmm... Hes, do you have player also? 09:15:52 Hes With a 40G disk installed. 09:23:43 MeRWiN Is there a Lee Marlow in the house? 09:24:16 merwin which one is he? 09:26:03 hardeep okay, i think i'm finally done with ffw/rew for 1.3. 09:26:32 merwin i didn't know ff/rw had anymore buggs? 09:31:08 hardeep merwin: hmmmm, why not make the second line customizable as well? 09:33:36 merwin well, it looks like we have a successful Preview "feature" now! 09:35:03 hardeep merwin: what's your disk spindown set to? 09:39:42 merwin Bagder: can't you just swap the two? 09:41:20 Bagder why does it matter where in the list the selected song ends up? 09:41:31 Bagder when you switch off repeat-all in the future you mean? 09:41:44 merwin what if you don't have playlist repeat? 09:45:48 Bagder I don't get it, what is the strange part? 09:46:04 Bagder that we don't see track numbers? 09:46:29 Bagder ah, you see index numbers and they just increase!? 09:47:42 merwin well, normally you have, say, 10 tracks on a cd... on the cd player it would display track 8 as being track 8... with ours, the 5th song in a normal play could be the 200th in shuffle. 09:47:45 Bagder what is not on yours? 09:49:40 merwin yup... it's just mentally throwing me off a bit. 09:49:46 LinusN what is most interesting, the index or the track numnber? 09:50:34 LinusN what is most interesting, the shiffled or the unshuffled track numnber? 09:52:19 LinusN or does it? 09:53:46 Bagder and how would a "fix" look like? 09:53:56 Bagder rotate the entire list N steps? 09:53:59 merwin Sju sköna sjösjuka sjuksköterskor på skeppet Shanghai. 09:54:07 Bagder and store N when resuming ? 09:55:02 LinusN Bagder: but you do see the problem? 10:01:06 LinusN maybe an option that uses the playlist buffer for that, lowering the playlist size limit? 10:02:44 rwood has there been any thought of nested playlists in some future release? 10:03:38 LinusN Bagder: on dir-play? 10:03:52 Bagder nested on dir-play? 10:03:58 LinusN maybe i misinterpreted the question? 10:08:38 Blaster_Master Just an sugestion : Is it possible to cache the directory structure or reserve some memory for it, including filenames. would it not speed up directory browsing quite a bit. 10:08:51 LinusN Bagder: so file system writes is 1.4? 10:12:51 merwin isn't there a variable dependant on player/recorder? 10:15:21 LinusN rwood: have you tried to disable AFE? 10:15:50 merwin Hes: what was Uwe's opinion on it? 10:18:13 LinusN yeah, the user expects the battery meter to show "time left" rather than "voltage left"
10:19:37 *** Saving seen data "./dancer.seen"
10:24:58 LinusN rwood: don't restore it, just clear it. 10:34:16 Bagder anyone tried the second snake game? 11:07:13 merwin Do variables declared inside of functions take up memory perminantly? 11:07:18 merwin or is it only globals that do? 11:08:39 merwin but if they aren't, then they only use memory temporarily? 11:10:39 langhaarrocker My demand for a Java VM was first! Que up at the end of the line of demands! 11:14:57 LinusN 5i11y w@R3z d00dz! 11:15:11 merwin 3y3 y4m 31337!! 11:18:12 LinusN doesn't it show? 11:19:03 LinusN and when you press F3? 11:31:07 LinusN Lowfiler: and you hadn't made any changes? 11:31:50 Zagor Bagder: nah, moving around a bit at home. swapped the bed and the computer. 11:33:19 Bagder LinusN: which one? 11:35:31 langhaarrocker what is the difference when I declare a module variable static or not? 11:35:48 Bagder you mean a function? 11:36:02 langhaarrocker no I mean a normal global variable. 11:37:02 Bagder but why doesn't Q39 show up? 11:37:23 Zagor Q39 shows up, but not Q40. I tried remaking it, and it's the same. dunno why. 11:37:38 LinusN ok, so the last q is a problem? 11:37:49 LinusN maybe a LF issue? 11:38:20 Zagor but the FAQ is a msdos text file, was it always? 11:39:50 matsl Zagor: Found a bunch of java classes for id3. Picked http://sourceforge.net/projects/jd3lib/ its LGPLed. Shouldn't be any problem!? 11:41:10 LinusN what was it? 11:41:24 langhaarrocker What makes Badger dislike Java? 11:42:56 langhaarrocker Ah. I see. The answer is not so much about java as about the people that like java? 11:43:24 Bagder "I came to visit your site while I was searching for articles like hacking through C. I am so amazed with your capabilities"
11:43:52 Zagor i'm going to lunch. see you later. 11:45:09 LinusN langhaarrocker: not about the people, it's more about OO and coding style. But let's leave that topic. We don't want language wars. 11:45:09 matsl Zagor|lunch: With a 15-line program I can now fill my screen with all id3-tags I ever wanted to know. Now what? Any idea how the database should look like to be useful. 11:50:30 matsl Bagder: I'm not planning to use it. 11:52:31 matsl ... I'd thought I could start that activity. 11:53:55 matsl A data base with id3-info that could be used instead of browsing the dir I guess. 11:55:20 bobTHC build by the player or on pc? 12:19:40 *** Saving seen data "./dancer.seen"
13:28:57 coutta Gents, is there something in the .m3u format which allows you to designate that the playlist is to be shuffled ? 13:29:42 coutta Are there "comments" in .m3u ? 13:30:46 Phil didn't it store the duration of the songs in those comments? 13:30:53 coutta Could we extend the format for Rockbox to include a shuffle indicator, using something like #rockbox ? 13:49:27 Snorlax where can you buy resistors in sweden?!? 13:50:00 Snorlax have checked elfa..
13:54:51 Hes LinusN: did you catch the I/O errors in the debugger? 13:55:45 Zagor Hes: they're propably just read errors. i'll add a retry soon. 13:56:47 matsl I think it is weird that id3->index is used together with playlist.amount in the 1 line id3 view. But it has beein in CVS now for weeks. What am I missing? 13:57:42 Hes Ok, I see. What about the read errors which cause the intro play feature? 13:58:46 Hes Do you have any idea why I have so much of them now? 13:58:58 Zagor are you using latest cvs? 13:59:11 Hes and merwin too. 13:59:21 Hes I built from CVS this morning. 14:00:46 Bagder hm, shouldn't the docs cvs commits get mailed? 14:01:32 Zagor Hes: wow, that much? and it became worse since the new sleep code, or since when? 14:05:26 matsl Anybody: Comment on the id3->index playlist.amount problem? 14:06:04 LinusN matsl: what prolbem? 14:06:12 matsl I think it is weird that id3->index is used together with playlist.amount in the 1 line id3 view. But it has beein in CVS now for weeks. What am I missing? 14:06:35 Zagor matsl: isn't it simply trying to make an "index/total" display? 14:06:41 Bagder it's the song number, isn't it? 14:08:46 matsl So its a problem with my mp3s then. 14:09:39 matsl OK. Then we have a bug. 14:10:53 matsl I'm sorry. I thought id3->was an id3-tag saying what song on the album it was. 14:11:33 Phil Is there a rough date when the next release is released? 14:12:44 matsl I'll revert to the current version of wps.c and see if I can find the bug. 14:13:09 Phil Badger could we wait until tomorrow? 14:13:17 matsl LinusN: And when you select song number two? 14:13:50 Phil Badger: uff. So do I. 14:14:04 matsl LinusN: I'll revert and try again. 14:18:49 Phil Bagder: Concerning roadmap V1.5. Next weekend I'll do some investigation and after that I'll decide wether I feel addicted to do an editor for splitting mp3. That'll be hard and deep work but it's a feature I really need and thus someone has to do it. If nobody else does I'll try to. 14:19:41 *** Saving seen data "./dancer.seen"
14:20:42 Phil Badger: Sometimes I crave for competitors winning the race. 14:23:04 Zagor LinusN: is it BSY while spinning down, you mean? 14:23:16 Phil Zagor: The better for me: Doesn't put me into trouble. 14:27:10 LinusN zero and assert INTRQ. 14:27:35 LinusN allow the device to enter Sleep mode. 14:28:16 LinusN automatically release INTRQ and enter Sleep mode after a vendor specific time period of not less than 2 s.
14:30:27 LinusN that should fix the "fortune cookie bug"
14:32:19 matsl Zagor: Now you'll be happy. I have unfound a bug. 14:32:41 LinusN you misplaced it? 14:32:50 matsl my head yes! 14:33:29 matsl id3->index isn't updated in the simulator. I was fooled by that! 14:33:50 matsl It works ok in the real hardware. 14:40:14 Hes didn't get around to doing that yet. 14:42:18 Hes should be a library-like function for displaying a long piece of text properly wrapped. 14:42:26 Hes Either until a key is pressed or with a timeout. 14:46:17 LinusN but do we read STATUS? 15:10:32 manitee can I ask a question about bug 588867, the mp3 skipping due to read error one? 15:11:06 LinusN manitee: do you get it when the unit is still? 15:11:09 manitee just wondering if you decided that it was actually do to file inconsistancies? 15:12:04 manitee is the sleep stuff in the daily builds now? 15:14:44 LinusN does it skip to the next song? 15:15:14 LinusN what rockbox version? 15:16:47 LinusN or can you publich it on HTTP? 15:18:58 adi|home i miss much? 15:19:35 adi|home too late.. ill scroll back!!! 15:21:27 adi|home there were no changes... so like.. umm.. what? 15:22:30 adi|home else.. what was the change? 15:22:39 LinusN why did CVS accept that commit? 15:23:06 LinusN or why doesn't it show the diff correctly? 15:23:21 Bagder from the roadmap "table"
15:23:41 elinenbe not really a bug, but an annoyance... when you fast forward or rewind on the recorder, the status bar (bar at the bottom) moves to the new location, then jumps back, and then jumps forward to the place you fast forwarded or rewound to. 15:24:43 adi|home is that why the new line additions weren't taking before? 15:24:46 adi|home because they are now..
15:24:54 elinenbe Zagor: so would a fix even be possible? 15:25:00 alphawave just curious, since the 2 middle lines on the layer are bitmap, can games be played? 15:25:02 LinusN elinenbe and Zagor: when does this happen? 15:26:53 elinenbe I tried Rockbox yesterday for the first time (daily build). I like the 2-like ID3 tag display. However, it is sort of frustrating that the 2nd line scrolls but the top does not. 15:26:53 elinenbe Personally, I like the option I have on my AudioTron - which is where you choose if the line will scroll ONCE, ALWAYS, NEVER... and I use the "Once" option. 15:28:16 elinenbe Zagor: that is just a request from a user... I think it is a nice idea too though. 15:31:45 adi|home Bagder.. in my emacs.. my 'delete' key is now acting like backspace instead of delete... any idea what happend? 15:31:52 manitee hey linus you still here? 15:33:07 alphawave im saving for a 17' imac! 15:33:46 elinenbe check out this matrix comparison of various players... check out the battery life under the archos! 15:34:32 Bagder paused before it became more economical to switch it off? Is it 1 minute, 5 minutes, 1 hour, 5 hours? " 15:37:28 LinusN "Driver required for all OS"
15:38:05 adi|home the comparison page Zagor? 15:38:06 alphawave i know can the archos firmwar do that? 15:38:35 Zagor nah, the ipod is very easy to beat. archos is a harddisk, iPod is not. 15:38:46 Zagor we can do whatever we like, iPod owners can not. 15:39:07 Zagor ah. well grab the best bits and we'll use them. 15:40:58 LinusN _seb_: any file, or just audio files? 15:41:28 Zagor _seb_: so it shows up on your mac desktop like any other harddisk? 15:41:30 adi|home would it make sense to start adding more of those links to the website? 15:41:36 adi|home for archos modding etc? 15:41:49 Zagor _seb_: ok, i was misinformed then. 15:48:28 manitee were you able to get the file Lin? 15:49:57 shampoo I am sure this is an FAQ but I am running v1.2 and there is major distortion on my juke6k.. has this been fixed ? 15:50:14 Zagor shampoo: please try latest daily build. we think it has been fixed. 15:50:44 adi|home did anyone mention try the daily build? 15:51:57 LinusN manitee: where in the song does it skip? 15:52:36 manitee Linus: did it do it for you? 15:54:39 LinusN didn't i add balance control? 15:55:04 adi|home then why do we have the 'snapshot' then? 15:55:17 * alphawave says ahh how long untill 1.9? 15:55:43 LinusN alphawave: defragmentation solved it? 15:56:28 adi|home guys.. have we given any thought to if ".rockbox" is a pre or post 1.3 addition? 15:56:34 adi|home got ya zagor..
15:58:12 Zagor oh, the power numbers in the battery faq are wrong. they are too high. 15:58:50 alphawave has the disk spindown min been moved yet? 16:00:16 Zagor alphawave: what do you mean moved? 16:05:44 alphawave why is this? 16:10:01 alphawave would it be possible to record from line in on the player? 16:10:38 Phil another FA (frequent answer)? 16:11:17 adi|home you want that in the FAQ? 16:14:25 Zagor Bagder: the question is, do we simply change configure or something else? 16:14:53 alphawave proponts i mean what is? 16:16:35 alphawave what are the chances of the buffer mod on the site? 16:16:53 Zagor what is the buffer mod? 16:17:46 Zagor well someone was looking at it a week or so ago. not sure it came to anything. 16:19:43 *** Saving seen data "./dancer.seen"
16:21:19 alphawave that would be a great mod though ave battry life to! 16:22:31 Phil I'd prefer a real studio quality stereo mic preamp over more buffer. 16:26:07 Zagor i have to run. see you later! 16:27:34 Phil don't cry: you have configurable wps. 16:30:57 alphawave when is apple gonna make a recorder ipod? 16:31:34 Phil Do you want to port rockbox -> ipod? 16:32:19 Blaster_Master how portable is the rockbox code? it´s written in C, right ?? 16:32:44 Phil I told you to make a VM and use Java! 16:37:31 alphawave can you make a rockbox version so you can use the new tfs partition? 16:38:05 alphawave it will still work? 16:38:57 alphawave be back later its breakfast time! 17:06:52 shampoo is there a shortcut to the volume ? 17:08:40 alphawave but don't you have headfones with a volume control? 17:09:32 shampoo the sound is quite good I must say..
17:10:36 shampoo for windows ? 17:11:23 alphawave plain text is good for me! 17:12:11 speedmerchant I'm having a problem with my rockbox on my JB6000 can anyone give a quick tip? 17:14:11 speedmerchant make any sense? 17:14:48 alphawave are you on linux windows or mac? 17:15:13 alphawave did you empty the recycle bin? 17:17:13 alphawave you did "safely" removed he archos right? 17:18:27 bobTHC have u seen the ipods mini software that u can install on ure ipod ? 17:18:40 alphawave you can do that? 17:26:20 alphawave maybe if i break my unit, send it back to best buy and maybe they let me get a recorder hink it will wrk? 17:27:58 bobTHC the 6gigs player is @220$/€ in france shpping included..
17:29:29 alphawave did you know you can pull the blue of the pouch without tearing it up though? 17:52:52 alphawave have you seen http://www.mctubster.com ? 17:55:54 alphawave is xircon a good irc client? 18:03:03 alphawave there xircon works! 18:04:12 bobTHC trillian rulez ! 18:04:44 alphawave your in france? 18:19:44 *** Saving seen data "./dancer.seen"
18:25:24 adi|home how do you mean? 18:27:17 merwin adi|home: weird... it must have just had a little code fart or something. So, how's the car? 18:28:26 merwin heh, bad karma, huh? 18:56:59 manitee hi folks - anyone here? 18:58:01 manitee press and hold or just wail on it? 18:59:40 manitee you trying to delete as root? 19:02:35 manitee any luck trying what I said? 19:27:14 manitee hey anyone else here? 19:28:48 manitee hey you running the RB daily builds naked? 19:32:31 merwin hold down the off button? 19:33:01 manitee same issue? permission denied? 19:35:08 manitee can you cd into it? 19:35:29 manitee type "touch temp.txt"
19:35:54 manitee do an ls: did it make a new file? 19:36:28 manitee huh, so root can create/write there - where are you trying to copy the files from? 19:43:43 adi|home whats the prob? 19:46:59 Hadaka_ why don't you mount it as the user you are using it as? 20:02:49 lohap PsycoXul: error: Obsolete k option not supported. 20:12:47 pimlottc it gave the same error as before? 20:19:48 *** Saving seen data "./dancer.seen"
20:21:05 manitee|away usb 2.0 support for mandrake? 20:25:39 manitee err not sure, i usually compile my own... pim? 20:33:50 manitee start and play? 20:35:32 manitee that restarts the current song? 21:46:43 Zagor lohap: didn't you have a recorder 20? 21:47:43 Zagor ok, and you downloaded the 2.4.19 patch? 21:49:03 Zagor go to the 2.4.18 kernel source root dir and run "patch -p1 < ../wherever/linux-2.4.19.patch"
21:49:17 juergen speaking of USB, would the recorder20 not work with USB11 at all? 21:54:42 lohap so how the hell do i update to 2.4.19 i need to download source and compile? 21:56:54 Zagor 2.5 is the development branch. lots of test code and bugs. 21:57:19 Zagor LinusN: ok, but this really shouldn't make a difference for the bug we see, right? 21:59:51 Zagor lohap-catchingup: because not all (commercial) unices have bzip2 installed. 22:11:28 WS64 For Linux you have a solution where you just have to connect your Archos. 22:11:50 WS64 Is it possible to get a bootable Linux floppy image that includes this deature? 22:18:02 WS64 That's why I ask... Maybe it's possible to create such an image (no idea about copyrights here) and share it with the rockbox community. 22:29:31 pimlottc you can't format a DOS floppy in winxp anymore can you? 22:30:59 WS64 pimlottc, a rightclick on a floppy in XP still brings me the format option.... Is that what you meant? 22:33:28 pimlottc ws64 - can you make it bootable? 22:35:18 WS64 Yes, it has an option "create MSDOS start disk"
22:41:27 LinusN HAHA! I killed the dreaded "ATA hang bug"! 22:41:56 merwin what bug is that? 22:43:35 Hes What was it? 22:43:59 dwihno|gone "That wasn't chicken"
22:46:37 Hes How about the intro play feature? 22:48:29 Hes I was actually referring to the intro play introduced by the I/O errors. 22:50:44 LinusN merwin: you have it all the time??? 22:53:27 merwin anyone got a build from a week or so ago? 22:53:35 LinusN and it always skips to the next song? 22:55:22 pimlottc "it's not a bug, it's a feature"
22:56:00 LinusN merwin: you use resume? 23:04:00 merwin LinusN : did you commit the patch for the ATA fix? 23:07:49 Silly_Fly is there a plan to implement an external programs support? 23:12:22 LinusN well night all! 23:12:25 nsauzede linus: 1 question only ? 23:12:53 nsauzede do you know if it's possible for rockbox to know when host has disc USB ? 23:12:54 dwihno Linus: Did you commit the ATA-fix? 23:14:24 nsauzede linus: Ok, thanks ! Good Night !! 23:14:47 LinusN merwin: just playing? 23:14:55 LinusN or fiddling with the settings too? 23:15:48 Zagor LinusN: how do you mean it released it twice? 23:18:37 Zagor LinusN: yes? and why did you add ata_perform_soft_reset? the only thing it does is take/return the mutex, just like ata_soft_reset did. ?? 23:20:39 Zagor i thought we ruled out a multithread problem from that? 23:23:40 Zagor doh. got it. good catch! 23:24:07 LinusN gdb rox again! 23:26:32 Zagor did he build from cvs himself? 23:32:09 Silly_Fly anyone having problems with the up button on the recorder?? 23:35:35 nsauzede zagor : do you know where I can find ISD200 datasheet ? 23:37:01 nsauzede any idea ? 23:37:53 Zagor it's only a logical operation on the PC side. the usb device doesn't know about it. 23:38:16 nsauzede oh, you mean the host doesn't turn off slave/master mode ? 23:38:56 Zagor no. it just flushes the caches and removes the devices from it's active device list. it doesn't even tell the usb device anything. 23:41:21 Zagor dwihno|gone: I don't have TV3. I don't pay for television. 23:43:47 nsauzede zagor : I finally (re) found the game for the player I told you about. It was done by Psyco Dedman..
23:43:57 nsauzede Are you interested ? 23:44:04 Zagor nsauzede: nice. have you tried it? 23:44:16 nsauzede works great ! 23:44:27 Zagor is it any fun? 23:44:54 Silly_Fly zagor : buttons act much better. thanks. 23:45:18 nsauzede Indeed, without a 131x64 bitmap LCD, we can't pretend to prot Doom(tm) for players..
23:45:25 Jet8810 are games possible for player? 23:46:07 Silly_Fly have you given any thought about including my snake game? 23:46:47 nsauzede zagor: I've done experiments with a 14x20 bitmap screen on my player..
23:47:45 Zagor nsauzede: fly simulation? does it look good? 23:47:46 nsauzede zagor: isd ? oops..
23:48:14 Synthe did y'all see the news that fraunhofer and thompson are now trying to charge $0.75 license fee for any MP3 decoder? 23:48:49 Silly_Fly nsauzede : so graphics is available for players too??? 23:49:01 nsauzede pimlott: well, I can post it..
23:51:50 Silly_Fly nsauzede : how frequently can you change them? 23:52:32 kargatron quick qstn: does latest rockbox have 'goto'? like going to track 50 of a playlist? 23:52:49 kargatron or for the moment do I just hit 'next' N times? 23:53:41 Zagor merwin: yes, we suspected it would. that's really nice! 23:54:51 nsauzede problem is when displaying pixels that are close to inter-charcell, the space is a bit too large..
23:55:34 nsauzede player-bitmap: if anyone is interested, I can post some clean demo-like..
23:55:58 pimlottc nsauzede - you mean the gaps between cells? 23:56:31 nsauzede it would be playable..
23:58:04 Silly_Fly what's the resolution of the player anyway?